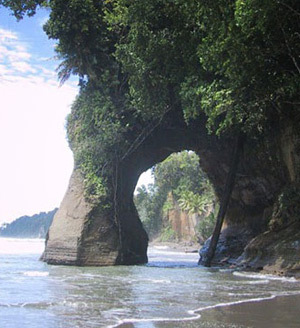 The name Karang Bolong means Rock (Karang) with a Hole (Bolong). This may have been some frozen lava, formed during the eruption of Mount Krakatau. Karang Bolong beach is the beach recreation area where there is a big rock with its hole in the center, facing the open sea. The Rock forms a gate facing the sea, making it look very picturesque. There is a small forest, which has been converted into a recreation spot. There is a river flowing down to the sea where people can have a bath of fresh water after swimming in the salty sea. Karang Bolong beach is located 50 km from Serang town or 140 km from Jakarta, on Karang Bolong Street.